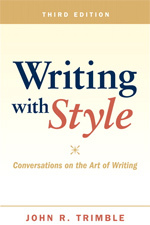 On October 19, 2012, we had an inspiring interview with eminent author and distinguished teacher of writing, Professor John R. Trimble, PhD, author of Writing with Style: Conversations on the Art of Writing. 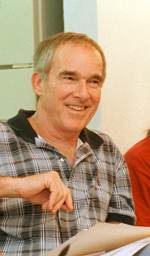 John Trimble is currently University of Texas Distinguished Teaching Professor of English Emeritus. He holds an AB from Princeton and a PhD from the University of California at Berkeley. But in 1970, upon finishing at Berkeley, he found himself drawn to Austin, attracted by the warmth of the people, the superb libraries, the lovely lakes, and UT’s nine spanking-new squash courts. He’d played squash competitively at Princeton, and while he was teaching in Austin, made good use of those courts, getting all the way to the finals of the Texas Open, a squash tournament open to professionals and amateurs alike. John is the author of the exceptional book Writing with Style: Conversations on the Art of Writing, which has gone through 40 printings, over half a million copies, and is now in its third edition, featuring two major new chapters as well as miscellaneous other enhancements. In the preface, John writes, “Books on writing tend to be windy, boring, and impractical. I intend this one to be different–short, fun, and genuinely useful.” And he succeeds. There is no skill more important for marketing your coaching or consulting practice, for advancing your career or for disseminating your ideas than being able to write lucid, attractive prose. John is a master at teaching and editing expository writing, and his book gives tips for getting unstuck, discovering and invigorating your style, and maintaining reader attention. While John began his career as an expert on Pope and Shakespeare, the explosive success of Writing with Style caused him to be suddenly identified as an expert in composition, which led to his being asked to develop–and teach–several new writing courses. One of these, “Advanced Expository Writing” (the now legendary “325M”), proved to be so much fun for him that he began focusing on a more practical mission–helping people improve their writing and editing skills. In fact, MentorCoach founder Ben Dean took that famous 325M seminar while in graduate school at UT-Austin. He remembers it as extraordinarily difficult: a course requiring weekly 4-page essays as well as the meticulous line-editing, outside of class, of all 15 papers written each week by his classmates. Nor was this all. In addition, they all faced a daunting syllabus, featuring dozens of essays and articles, all collected in a couple of 2″-thick xeroxed manuals, as well as several course texts. He somehow survived, though, and found the course a truly life-changing experience. John TrimbleWhile 325M was John’s signature course, he soon began branching out into American Literature, too, offering courses like “Psychological Themes in Modern American Drama” and “The 20th Century American Short Story.” But writing remained a substantial focus of all his courses. To him, expository writing was yet another form of art, a performance. Skilled writers, he says, offer not only interesting ideas but also a compelling presentation of self–and in an authentic voice. Over his 36 years at UT, John earned many national and university teaching awards. 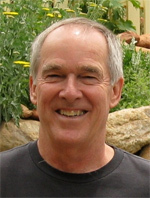 Even now, though nominally retired, he feels his prime mission is to help people “learn to write prose that’s tight, sharp, and bright.” A master editor, he continues to find time to provide freelance editing for lawyers, fellow professors, amateur and professional nonfiction writers of all stripes, and book publishers. He and his wife Jan currently make their home on a 5-acre hillside property near Pikes Peak, just west of Colorado Springs. Among his passions, he confesses to loving all things Italian, especially Tuscan hill towns, Deruta pottery, and arias from La Bohème. A lover of the arts, he is especially drawn to residential architecture, gardens and gardening, interior design, and handcrafted objects in various media. Meanwhile, he also enjoys grazing the Amazon bookstore, reading lots of nonfiction, revisiting the work of architectural theorist Christopher Alexander (especially his classic A Pattern Language, John’s all-time favorite book and his bible for the custom Tuscan home that he and his wife designed in Colorado), and keeping up with many of the thousands of grateful students he’s taught.